Photo Courtesy of Gabrielle Bolden. 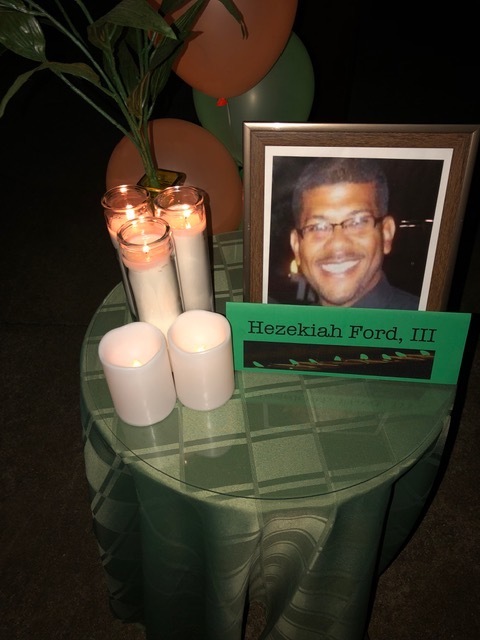 A candlelight vigil was held Thursday for Florida A&M DRS instructor, Hezekiah Ford III. FAMU DRS Interim Superintendent , Kirk Gavin gave a welcome speech at the vigil in the FAMU DRS courtyard. “We gather together this evening to celebrate the life of an outstanding secondary school mathematics teacher and previous adjunct professor of mathematics at Florida A&M University,” said Gavin. Ford was sick and two days before his passing all he was concerned about was his students because they had an exam to take. Ford’s love, generosity, dedication and impact were highlighted by his friends, colleagues and family at the vigil. Jamira Napier’lanh, who has known him her entire life, said he was a loving man. The mathematics instructor died Feb. 21. He was 51. Audrey Lewis married into the Ford family and reminisced on the person Ford was. “One person said, you didn’t have to make up anything because the life he lived while he was alive will still be remembered through his colleagues and most of all his students. Even up until his death he was worried about his students. He had a deep love for family." "He wanted family to know each other and know their heritage and know the legacy. He came from a long line of great educators, agriculture, entrepreneurs, and mathematicians . He’s going to be greatly missed, always a smile, nothing negative,” Lewis said. During the vigil Terrence Milton read a scripture and Brooke Hobbs read a touching poem written by Hezekiah Ford II. Throughout the years, Ford touched many lives; he was a dependable person with a smile that lit up a room. The candlelight vigil ended with a closing prayer and an amen from everyone who attended. A celebration of life ceremony was held on Saturday at the St. James Baptist church in Ford’s hometown of Mulberry.